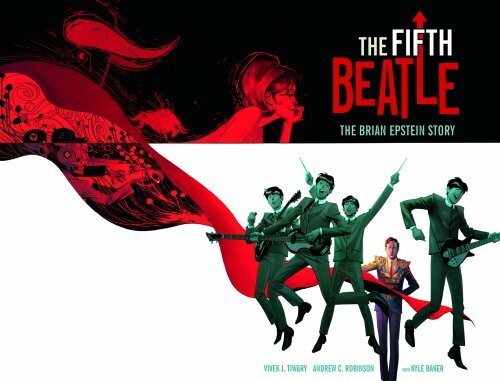 Sitting down to write a review of The Fifth Beatle: The Brian Epstein Story is a new experience. It’s something I don’t do. I get other people who can do that much better than I can do do that. That’s why I also maintain, but not write for, Road Rash Reviews. Where do I start with a review. What should I say? I don’t know. Let’s take this journey together and find out about The Beatles’ manager, Brian Epstein. It’s the story of a man who took a reasonable pub band and made then world famous in a matter of a few years. From first seeing them in Liverpool’s Cavern Club via a worrisome tour of The Philippines – drawn in a totally different style from the rest of the graphic novel – the book takes us through the ups and downs of managing such a group. I have to say now that I am a huge Beatles fan but Brian was an enigma. I didn’t know that much about him apart from what everyone knows – He was gay, in a time when it was illegal in Britain, he ran a very successful record shop in Liverpool and the way he manipulated EMI into getting The Beatles’ first contract with their subsidiary , Parlophone, after their “Comedy album producer“, George Martin – Someone who has also been called “The Fifth Beatle”. This time by the press but not the band themselves. The novel covers the time from when he first met The Beatles in 1961 to his untimely death in 1967 at the young age of 32 from an accidental drug overdose. This really helps bring the vibrancy of the ear as well as the dinginess of Liverpool into crisp focus. The characters are more caricatures of the people involved, but easily recognisable . More done to bring out their personalities and not to be mean. This is only changed when Brian meets “Colonel” Tom Parker, Elvis’ manager who is drawn as, well… The Devil. The only disappointing part is a question that isn’t touched upon. Where is Pete Best in the story? He seems to be totally missing even if he is in the story at the beginning. How and why was he sacked and Ringo also appears in the periphery of the story as well. The fate of Drummers around the world. I will leave you with the trailer for the graphic novel that I discovered over on the book’s official website. If anyone was the Fifth Beatle, it was Brian [Epstein]. Hitting the shelves in stores, the internet, and probably the odd record shop, from November 19.